The Fire Data Lab is dedicated to accelerating the use of data-driven decision making in the fire service throughout the United States. Created as a partnership between the Western Fire Chiefs Association (WFCA), multiple Public Safety Organizations (PSOs), and Intterra, the Fire Data Lab (FDL) facilitates the sharing of data among participating agencies. The goal is to improve fire service outcomes by revealing opportunities to do things like shorten call response times, or better allocate resources. Using science and data for better planning and decision making means fire agency leadership has a better foundation to build toward better results. Read on for more detail about how you can bring data science into your operation. Using the Intterra data visualization platform for analytics and reporting, the Fire Data Lab integrates and displays a living, dynamic data set that fuses information from Computer Aided Dispatch (CAD), Records Management Systems (RMS) along with AVL and data gathered in the field. By accessing anonymized data through Fire Data Lab, participating organizations can understand how they are performing across particular metrics (such as reflex time, call processing time, or assembly of minimum effective firefighting force), and gain insight into comparative performance in relation to other agencies. By looking at where these incidents occur, along with population density and other data points, participating agencies can review and compare data to make improvements in processes, and positive community impacts. Chief Jeff Johnson (ret. ), CEO of the Western Fire Chiefs Association, shares a hypothetical example of how Fire Data Lab data can help participants to improve outcomes. Perhaps there’s a Fire Chief in a midwest city who notices performance differences when comparing his department to a peer in the northwest. When comparing the performance of his own department to that of a similar organization, the Chief notices the other department is averaging more than a minute faster response time on cardiac arrest calls. In comparing the data via Fire Data Lab, the midwest Chief is quickly able to learn that one of his department’s own greatest barriers is a slower speed getting to the patient due to numerous internal processes. Fire Data Lab visualizations, including a brand new comparative dashboard, can allow the midwest Chief to learn precisely where his own protocols are slowing responses, and then discuss with peers, like the northwest Chief, to learn the best path to effective remedies. The Data Analytics Summit pulls together the community of leaders using the Fire Data Lab, and allows Intterra to develop and evolve around what they need and how to display data. Part of the mission of the FDL is to facilitate communication and cooperation among fire agencies in order to share ideas, refine processes, save money, and ultimately, to provide better outcomes for the communities they serve. The organization hosted its first summit in San Diego, California recently, and was able to get participants together to discuss their experiences from the first year of the FDL. Users suggested features and functions that would make their engagement with the platform even more useful. It’s not news that science, technology and data impact daily lives throughout the globe. People use mobile devices to shop, get directions and connect with friends and family about matters both trivial and important all day long. It follows that demand for such connectivity follows into every industry and workplace. As first responders get more access to more software, technology and tools that enable mobile access at work, process changes ripple up. Chief Jeff Johnson provides an example. 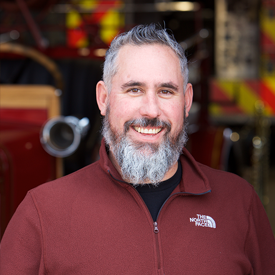 When it comes to using data and technology via Intterra and the Fire Data Lab, the Western Fire Chiefs Association is focused on educating users and the vending community about the effects improved visualization can have. Leaders in public safety continue to execute, broaden the conversation, and broaden the applicability of new technology.